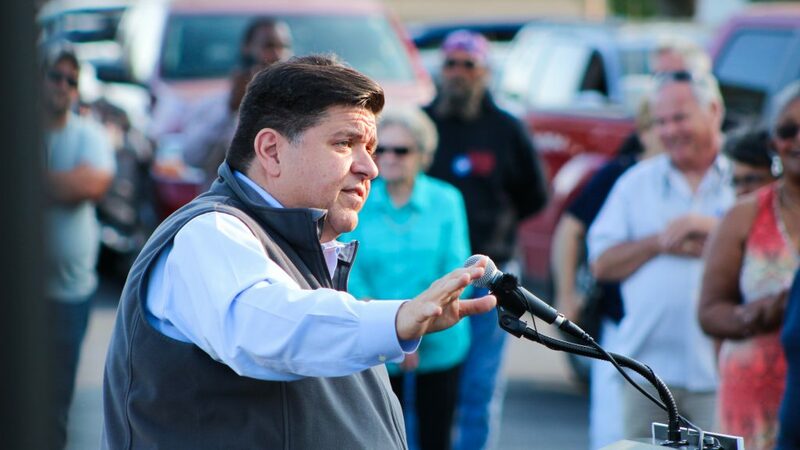 J.B. Pritzker speaks with union supporters at a 2017 rally in Springfield. He's scheduled to take the oath of office at 12:01 p.m. Monday. J.B. Pritzker is set to becomes the 43rd governor of Illinois on Monday. He won in part by promising to make college more affordable, improve the state’s finances, and reform the criminal justice system. Brian Mackey interviews Gov.-elect J.B. Pritzker on the eve of his inauguration. Experts have said if politicians really want to bring down the prison population and end mass incarceration, you have to be willing to look beyond the “nons” — this is non-violent, non-serious, non-sexual offenders. And so I wonder: In order to get serious about criminal justice reform, are you willing to look beyond the nons? I have one of the great criminal justice reform advocates and restorative justice experts as my running mate, and that’s Juliana Stratton. And we’re creating an Office of Criminal Justice Reform and Economic Inclusion. You know much of what our focus is on is not just avoiding recidivism and reducing the prison population by perhaps having different sentences, but also keeping people out of prison in the first place. We’ve got a lot of work to do in this field. I know that there were some criminal justice reform proposals that were passed and implemented in the last administration, but there’s a whole heck of a lot more that we can do. And again, I’m working with Juliana to make sure that we’re going to implement those policies. But if you were sentenced for murder before the mid-’90s, it might be a 20-year sentence. And now it’s a 40-, 45-year sentence. Could that be lower? Murder, obviously, is a very, very serious crime. So I’m not looking right now at reducing sentences of people that have committed heinous crimes. But one thing that we’re going to do is to legalize, tax and regulate cannabis for recreational purposes. And there are people who have touched the system — that have been put in prison — for things that under a new set of laws would be would not be illegal. And so we’ve got to look at the commuting of those sentences, pardoning, all the various methods that are available to a governor to reduce sentences and expunged records. Although as you know, very few people are in state prison for just marijuana offenses. Well, some people who you know went into the business, so to speak, of selling marijuana are. And so we’ll be looking at that. But look at how the laws are prosecuted today. When you say prison, how about jail? The jails are often full, too. And that’s another thing I just want to point out is a lot of people who end up in jail have mental health issues. If you want to talk about criminal justice reform, you’ve got to talk about the holistic issues facing the people who end up in the system. That’s how we’re going to prevent recidivism and it’s how we’re going to prevent people from actually going to jail or prison in the first place. So let’s turn to higher ed. You said you want to lower the cost of college for everyone in Illinois, the Illinois Board of higher education wants a funding hike this year of 16 percent — you’re smiling — but this is for grants for low-income students as well as just university operations. They say there’s no other major area the state budget that’s funding level is below where it was in 2002. Can you approve that 16 percent request? Well you know how committed I am to making sure that there is affordability for people who want to go to college. I’m also focused on vocational training because there are an awful lot of kids who choose not to go to college but need to get the skills necessary to get a good job. But when it comes to higher ed, we have a lot of work to do in the state. I’ve advocated for expanding the AIM HIGH scholarships, I’ve advocated for expanding in a significant way the MAP grant program to 70,000 more kids. Lots of people apply for a MAP grant, and then they qualify but they don’t get it, because they run out at a certain date. I just want more people to have the opportunity to stay in Illinois. This is one of the great problems when we talk about the exodus from our state: young people are getting up and leaving and their families are too, because they can get a better deal if they move to another state and take in-state tuition there. Does 16 percent sound like a reasonable request? Right now I would say that we have a lot of fiscal challenges in our state. So, you know that I’m committed to lifting up our universities and making sure that we’ve got proper funding for them, but as to 16 percent I wouldn’t comment about the specific percentage. Just to say that I agree that our universities and colleges are underfunded. Speaking of the budget and the fiscal pressures on Illinois: late last year, S&P Global Ratings said Illinois government finances are at “elevated risk” in the event of another economic downturn or a recession, and that there hasn’t been enough focus among Illinois policymakers to tackle the structural deficit (and) the backlog of bills. In the event of an economic downturn or a recession — and since your progressive income tax proposal is at best two years out — would you consider raising the flat tax to help shore up state finances? No, I’m committed to getting a graduated income tax for the state through a constitutional amendment. In the meantime, we’ve got to look at bringing efficiencies to state government. We’re in the midst of a what is now I think in year four of a massive computer infrastructure upgrade for the state that hasn’t yet gone into effect, that will help us bring efficiencies. There are lots of other things that we’ll do from each one of our agencies in state government to bring down costs and also raise the level of service that’s being offered to people. We do have elevated risk. You just said something that seems obvious to me, which is there are no reserves in state government. If we had a brief recession, it would be certainly deleterious to the state in a major way. I am focused on balancing the budget this year and it’s why I’ve been very serious about bringing people in who I think are committed to that. But that team, our collective team, and my individual focus on getting it right means that we’ll be in a better position next year than we are now. But you’re right: We’ve been left four years now that state government has gotten much worse, much worse — its financial condition. So does that mean the flat tax stays where it is or are you open to changing that if Illinois (goes into recession)? Because the last time we had a recession, state finances went through the floor. My intention is to focus on the graduated income tax as a constitutional amendment. More state legislators than I can count have resigned from the General Assembly on one day, and they become lobbyists the next — often working in the very issue areas (in which) they were active as legislators. Former state Rep. Lou Lang, who resigned last week, could be working on sports betting and cannabis legalization. Should the revolving door be locked for state legislators the way it is for executive branch officials? There’s a lot that we need to do in terms of ethics. That’s something you’ll hear more from me about during the course of my first month in office. I just think that there hasn’t been enough focus on it. It is something, unfortunately — Illinois is not known for its high ethical standards that have been breached by a number of people. So we’ve got to look at all of these issues and ask where are we getting it wrong and where should we be clamping down? But I don’t disagree that there are conflicts of interests that need to be eliminated or diminished significantly. Is the revolving door one of them? Should that be locked? Yeah, I mean, I think that — I guess what I would say is that we have a citizen legislature and so people have to be able to go earn money when they leave. They’re going to earn money while they’re in the legislature, too, in other professions. And as long as we have a situation like that where people are not full-time legislators and barred from having outside employment, this is going to be a real issue. But you’re not going to weigh in, then, on whether specifically there should be a prohibition on legislators becoming lobbyists right away. Well you’ll see our ethics proposals that we’re going to put forward and you know, I think we’re I’m very focused on making sure that we’ve got a highly ethical government. Late last week your transition announced a system by which your top staffers would be paid not only by the taxpayers, but also by you, personally, through a limited liability corporation. How can you assure the people of Illinois that your staff will be loyal to them and not to the man who is giving them private pay for public sector work? Well each of them has agreed that they are working for the state and not for me. They are state employees. I’ve been very transparent about what we’re doing. I think that’s not been the case with everybody that served as governor. And it’s very important to me that that each one of them knows that they work for the taxpayers of the state. Now, as you know with the combination of the new offshoring prohibition the that was passed last year because of Gov. Rauner using people from other agencies as part of his governor’s office, as well as the fact that salaries really have not been commensurate with the quality of the talent that I think we should have in the governor’s office, that’s why I set it up this way. I didn’t want to cost the taxpayers more. In fact this cost the taxpayers less, because many people are being paid less from the state government. They’re actually going to get a smaller pension as a result of that, and I think this ends up being very good for the taxpayers. And they are committed. They are taking their own sort-of oath that they work for the people of the state. Doesn’t this lend credence to the idea that we are becoming an oligarchy? That you have to be an independently wealthy person who can supplement the salaries because the taxpayers can’t afford to do it? PRITZKER: Well we need to deal with the fiscal challenges of the state so that people can get paid properly in the positions that they’re in, that we’ve got the leeway to do that. Look, I just chose some extraordinary people for whom — they’re (currently) making multiples of what they will be making even with the additional income that they’re getting. And they were willing to take that salary cut to come do the right thing for the state. But many of them have multiple children in college and they’ve got other commitments. And so I wanted to make it as fair as I could for them as well as for the taxpayers, and so I’ve taken that burden on myself.